Editor Note: This story originally was published on April 1, 2019. Happy April Fool’s! 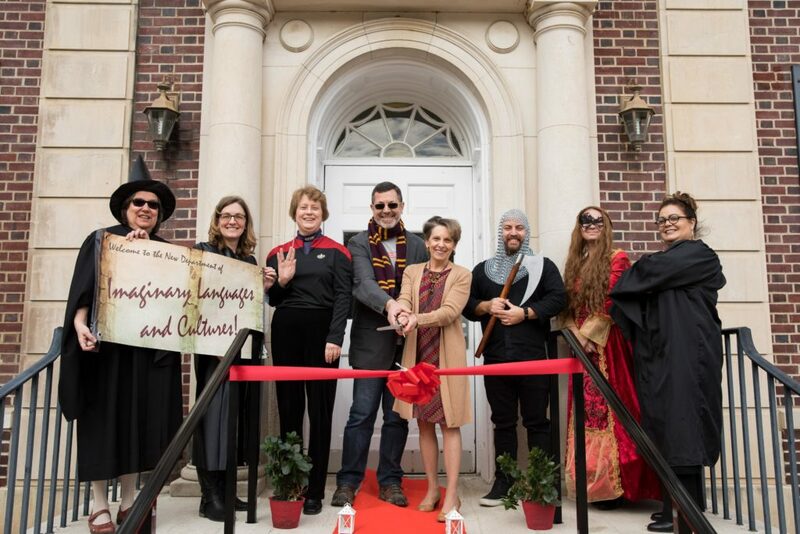 In a groundbreaking transformation of its commitment to the study of contemporary society, The College of New Jersey announced today that beginning in fall 2019, the Department of English will become the nation’s first Department of Imaginary Languages and Cultures. “Over the past decade, we’ve seen an astonishing growth in the number of students coming to the English Department to study J.R.R. Tolkien, Harry Potter, Black Panther, and many other texts that, ideally, involve the mastery of imaginary languages, such as Elvish, Klingon, Khazdul, or Dothraki,” Professor Glenn Steinberg, the current department chair, said. “We’ve come to realize that virtually every one of our faculty members has become fluent in at least one such language over their careers, and, simply put, we’ve already taught enough Chaucer, Shakespeare, Milton and Faulkner to last a lifetime.” Professor Steinberg added that he will continue as acting chair for the 2019-2020 academic year, although his new title will be Arthur Weasley Muggle Professor of Imaginary Literary Studies. On March 13th, TCNJ’s President, Kathryn A. Foster, attended a celebration of the new department in Bliss Hall. For the ribbon cutting, President Foster used a sword that Felicia Sackville-Steele, Professor of Quenya, cryptically described as “having appeared in the moonlight, rising out of Lake Ceva,” referring to one of the two lakes on TCNJ’s campus. “I’m thrilled that TCNJ’s English Department has made this groundbreaking transformation,” President Foster said. “The new Department of Imaginary Languages and Cultures stands on the cutting edge of new developments in cultural and linguistic studies, and what’s more, it offers a way for our dedicated faculty to embrace and celebrate their authentic selves,” she added, while edging away from Hrothgar’s axe. She added that she hoped Professor Steinberg would no longer insist on opening academic meetings by waving his wand and muttering cryptically under his breath, even though muttering cryptically under one’s breath is an important expression of imaginary language and culture.